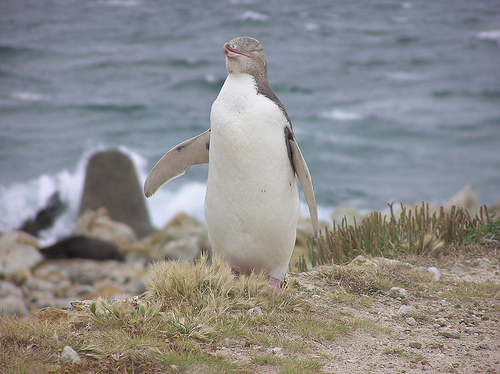 Also commonly known as the Hoiho in its native land, the Yellow-eyed Penguin is native to New Zealand. 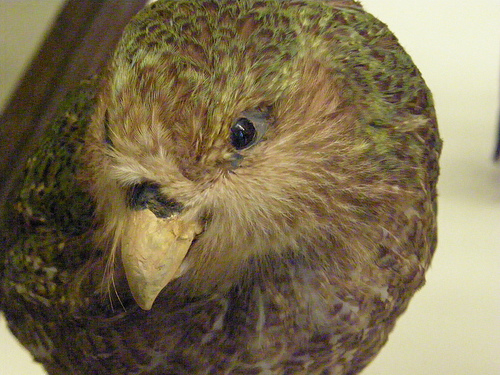 It breeds all around New Zealand’s South Island, as well as in Auckland, Stewart, and the Campbell Islands. Tourists can see these penguins at the Otago Peninsula, where they can closely observe penguins from trenches, hides, or tunnels. It is the sole species in the genus Megadyptes. It was previously thought to be related to the Little Penguin, but recent molecular resarch shows that both nuclear and mitochondrial DNA suggests it split from the Eudyptes ancestors around 15 million years ago. 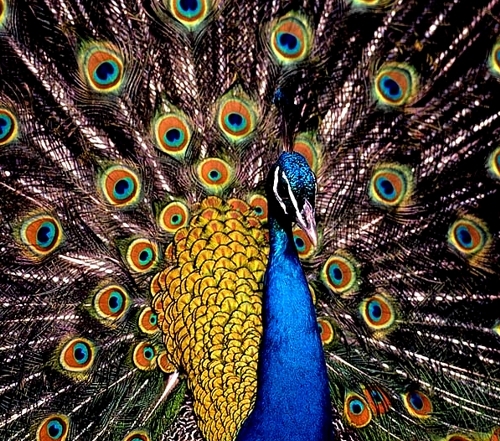 This animal was first described by Jacques Bernard Hombron in 1841. This penguin is fairly large. It is about 75 cm long, and has an average weight of 6.3 kg. However, weights vary througout the year, as it is about 8 kg before moulting and about 5 kg after moulting. Distinguishable features include a pale yellow had with paler yellow irises. They have black feathre shafts. Their throat and chin are brownish-black. They have a bright yellow band running around its eyes to the back of its head. However, juvenile yellow-eyed penguins have a grey head with no yellow band, and its iris is grey. Yellow-eyed penguins live in nests. 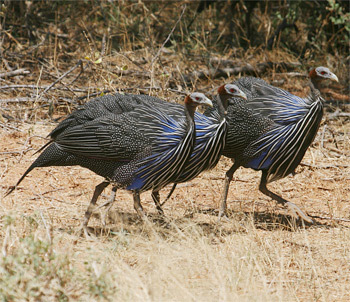 These nests are usually in scrubs or forests, around lupin and Native Flax. They are an endangered species, with a population of about 4000. As a result, it is thought to be one of the world’s most rare penguin species. It may also be the most ancient of all penguins alive today. The main threats to its life include introduced predators and habitat degradation. Another threat to type Yellow-eyed Penguin is disease. In 2004, a previously unknown disease killed 60% of this penguin species’ chicks in North Otago and the Otago peninsula. It has now been linked to a Corynebacterium infection, which is related to a bacteria which causes diptheria in humans. 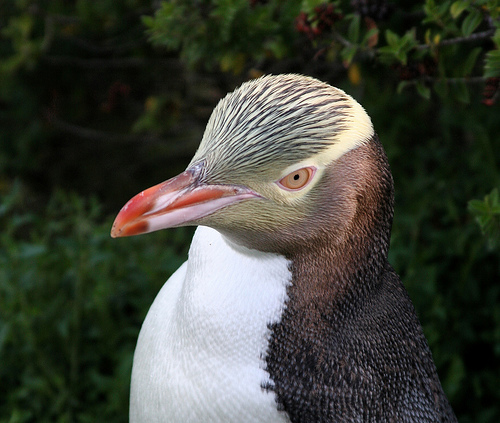 A similar problem also affected the Stewart Island Yellow-eyed Penguin population. Yellow-eyed Penguins have a typical daily routine. They forage between 7 to 13 km offshore, and travel about 17 km away from their nesting site. These birds will leave at dawn and return in the evening to rear their chicks. However, they may spend up to 2 to 3 days at sea at certain times. They pursue prey in depths of 20 to 60 m. 90% of the Yellow-eyed Penguin’s diet is made up of fish. Cephalopods like the arrow squid make up the other 10% of its diet. Types of fish this penguin eats include blue cod, red cod, opalfish, and the New Zealand Blueback Sprat. The Yellow-eyed Penguins feature in daily New Zealand culture. This bird appears on New Zealand’s $5 note. It is also the mascot for the City of Dunedin’s recylcling campaign. It is also used in the Farce of the Penguins, which is about global warming. Funnily enough, the habitat of these birds usually lack snow.